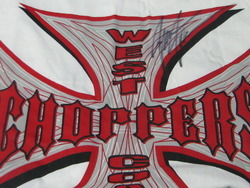 Men's West Coast Choppers T signed by Jesse James. West Coast Choppers T-Shirt signed by artist and designer Jesse James. All items are deemed AUTHENTIC and have a LIFETIME MONEY BACK GUARANTEE on the FULL PURCHASE PRICE. Picture does not do this item justice. The autograph is done in black sharpie and is sharp and clear.